Panasonic’s flagship 2018 4K Blu-ray player supports Dolby Vision, HDR10+ and Alexa | What Hi-Fi? The DP-UB820 sits above the DP-UB420, DP-UB330 and DP-UB320 to complete Panasonic's four-strong 2018 line-up. When it comes to Ultra HD Blu-ray players, Panasonic appears to be upping its model count every year. Hot on the heels of the debut DMP-UB900 4K player in 2016, came the UB300 and UB400 in 2017. And now four new models are on the way for 2018. But as the saying goes, it's quality not quantity - and Panasonic has made developments over previous models in the hope to deliver on both. Like Panasonic’s 2018 OLED TV line-up, all four Ultra HD Premium-certified players feature the company’s second-generation HCX Processor. The DP-UB820 and DP-UB420 also add support for HDR10+, with the former also supporting Dolby Vision HDR (the direct rival to HDR10+) - despite Panasonic's OLED TVs continuing to eschew the technology. 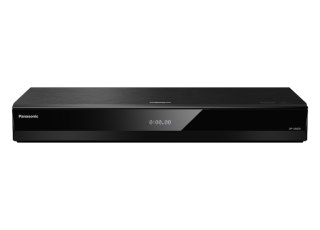 The flagship 4K Blu-ray player is also the only machine in the line-up to support 7.1-channel audio. The DP-UB820 and DP-UB420 feature HDR Optimizer technology, which performs tone mapping on HDR TVs to ensure optimal HDR performance – mostly for the benefit of owners of more affordable HDR TVs that don’t have the processing of top-tier models. All the 2018 players feature Full HD to 4K upscaling, HDR adjustment for various brightness conditions, and Dynamic Range Conversion, which aims to improve the contrast performance of non-HDR TVs. While pricing hasn't yet been confirmed, the new 2018 Panasonic 4K disc players will likely hit shelves in spring. HDR10 vs Dolby Vision – which is better?